If your camera produces the video files in a MXF file, it can be difficult to edit the footage in Microsoft movie maker (Windows) or Final Cut Pro (Adobe). However, this does not mean that your file is not editable. Instead you will just have to do a little extra work and covert the file to the proper file format. If you are like the person who’s story we shared, and also having trouble with your file formant, rest assured. This article will teach you the ins-and-outs of how to properly convert you file format into something you can easily edit. How to convert MXF to Apple ProRes? There are a lot of different converters you could use to do this. Wondershare UniConverter (originally Wondershare Video Converter Ultimate) is one of these products. It will enable you to decode your footage, and convert the MXF to ProRes extremely quickly. It will also allow you to covert your MXF file to nearly every other type of video footage formant. This includes MP4, AVI, MOV, MKV, WMV, FLV, etc. This will allow you to never have issues playing your footage on any platform including your iPhone, iPad, personal computer, Blackberry, Playstation, Xbox, and more. 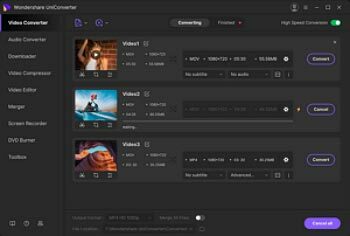 The software also includes basic editing features that will allow you to alter the footage by adjusting the volume, extracting audio from MXF video and even more. Part 2. How to convert MXF and AVCHD to ProRes on Windows? To convert the file is actually quite simple. Be sure to follow the following steps to ensure that your footage gets converted quickly and efficiently. Step 1 Download the ProRes converter. Using Wondershare UniConverter (originally Wondershare Video Converter Ultimate) will give you some of the best results. Step 2 Import the MXF, avchd or other videos, and make sure that they load properly. Backup the footage before you try to convert to ensure you don't loose any of your footage. Part 3. How to convert MXF and AVCHD to Apple ProRes on Mac? To import the desired file just drag and drop it into the reader. If you would like to convert the file you have chosen too, just drop them in the folder where MXF files are in the program. When it is time to select your output format, you will find a small triangle in the right side beside your profile. Choose “ProRes Apple ProRes codec (*mov)” as your desired format. This will ensure that you produce a file that you will be able to use on your machine. In the final step you will start the conversion of the file. Just click on the round button that says “Convert” and this will let the MXF to Apple ProRes Converter change your file. The hard work that is happening behind the scenes will occur automatically. Remember, to be patient because it could take a few minutes. Once you finish you will be able to further edit your footage in software such as windows Media Player and Final Cut Pro! This will allow you to make some serious editing to your footage and turn it into the film, movie, or project that you wish it to be.